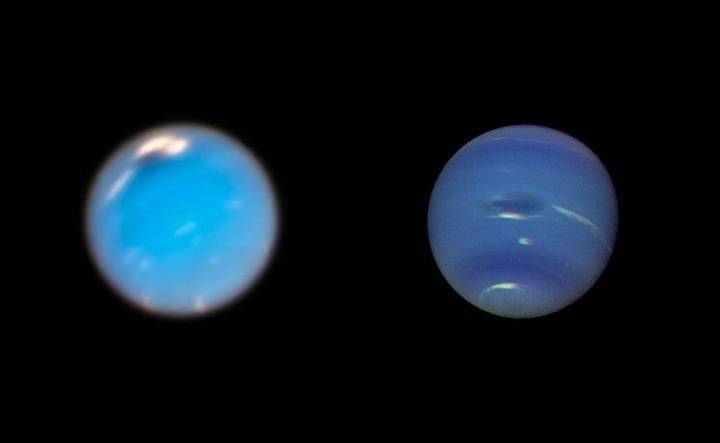 This is a composite picture showing images of storms on Neptune from the Hubble Space Telescope (left) and the Voyager 2 spacecraft (right). The Hubble Wide Field Camera 3 image of Neptune, taken in Sept. and Nov. 2018, shows a new dark storm (top center). In the Voyager image, a storm known as the Great Dark Spot is seen at the center. It is about 13,000 km by 6,600 km (approximately 8,000 miles by 4,100 miles) in size -- as large along its longer dimension as the Earth. The white clouds seen hovering in the vicinity of the storms are higher in altitude than the dark material.